SoulCalibur VI was the fourth game captured during Gamescom at Namco Bandai's booth. 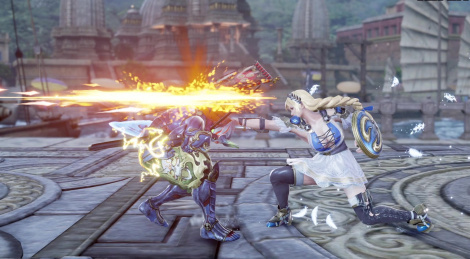 Sophitia, Yoshimitsu, Xianghua and Siegfried will show you their skills in the video. Thanks for the direct feed, this game is done no justice with compressed youtube vids. tbh i blame the general disinterest in the genre, and developers being forced to cut costs because of it. Don't forget about them already talking about DLC Soul Calibur characters that aren't even in the final game. 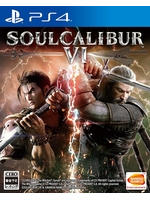 That's instantly put me off buying it now, thanks Namco Bandai, the last publisher that didn't want to rip us off in this area but clearly do since Tekken 7. And I know I've said it time and time again but its crazy how the kings of stiff and awkward animations in their fighting games, NetherRealm Studio, have somehow put out the best looking fighter this gen, with a modified Unreal Engine 3 game too, because they weren't afraid to go back and build their characters from the ground up for next gen from the previous game. The characters is Injustice 2, don't even look like the same characters from the first game because they weren't afraid to take a risk and they ended up with a better looking characters for 2017 because of it. In Tekken 7 and Soul Calibur VI the characters look pretty much like they did since PS2 gen graphics. And people still buy it....Amazing. This looks really terrible whether it's budget cuts or lazy devs. This is one of the reasons that fighting games don't look like Uncharted 4. The other is the demand on perfect(ish) performance and high framerates. This series never had the budget to push the graphics that some people seem to expect. They also had the benefit of being developed on arcade hardware that exceeded any home console in the past, which made ports on early 3D systems seem far more impressive. Because it's UE3 and because they do things like cheat and use 30 fps supers etc. SFV's DLC turned out to be a better deal than any of Namco's current fighters. Partly because that's friggin' nonsense.